Considering the deep roots of Christianity in the cultural experience of the African American community, it is only natural that even in the most cursory of discussions on Black history, the hope always is raised of discovering Christ as a man of colour. Moreover, in this global village of television and transatlantic travel, the standard Euro-centric portrayal of Christ is both anomalous and anachronistic, particularly in these racially sensitized times. It might therefore prove a great source of spiritual strength and psychological affirmation for those of us of African descent if a relatively unknown and forgotten medieval European tradition regarding the image of the black was reconstructed for all to see and share. What I am referring to are the coat of arms of the blackamoor which proliferated in both the private and civic European escutcheons (coat of arms) throughout the 13th, 14th and 15th centuries. Due likely to the tradition attached to Sardinia's arms, these insignia have been all too facilely explained as the grizzly prize of some crusader conquest. The four African heads each displayed in one of the four quarters created by the cross on the shield are referred to by an early motto associated with this island's crest as 'trophea.' The traditional explanation is they represent the four Moorish emirs who were defeated by a king of Aragon sometime in the 11th century. (The possibility of a more probable approach to these insignia will be raised further on.) Such an interpretation would, of course, be more than welcome today, especially in the face of establishment attempts to portray as white the Islamic power that was able to withstand three successive waves of European invasions. And, a common corollary to this negative view was the African figure became a symbol of evil, universal or personal, that had to be subjugated or vanquished. Given the economic/political positions of those with the right to bear arms, the hold that heraldry has had on the imagination of the West has been a very powerful one and this particular perception of the blackamoor as a symbol of the negative has undoubtedly played an enormous part in the propagation of racism. Modern specialists in the science of heraldry suspect, however, that this blazon (coat of arms) of the blackamoor is instead the very opposite of a negative symbol. In the last decade or two it has been pointed out that the moor's head quite possibly could have referred to St. Maurice, the black patron saint of the Holy Roman Empire from the beginning of the 10th century. Because of his name and native land, St. Maurice had been portrayed as black ever since the 12th century. The insignia of the black head, in a great many instances, was probably meant to represent this soldier saint since a majority of the arms awarded were knightly or military. With 6,666 of his African compatriots, St. Maurice had chosen martyrdom rather than deny his allegiance to his Lord and Saviour, thereby creating for the Christian world an image of the Church Militant that was as impressive numerically as it was colourwise. Here, no doubt, is a major reason why St. Maurice would become the champion of the old Roman church and an opposition symbol to the growing influence of Luther and Calvin. The fact that he was of the same race as the Ethiopian baptized by St. Philip in Acts of the Apostles was undoubtedly an important element to his significance as well. Since this figure from the New Testament was read as a personification of the Gentile world in its entirety, the complexion of St. Maurice and his Theban Legion (the number of which signified an infinite contingent) was also understood as a representation of the Church's universality - a dogmatic ideal no longer tolerated by the Reformation's nationalism. Furthermore, it cannot be coincidental that the most powerful of the German princes to remain within the Catholic fold, the archbishop Albrecht von Brandenburg, not only dedicated practically all the major institutions under his jurisdiction to St. Maurice but in what is today one of the most important paintings of the Renaissance, had himself portrayed in Sacred Conversation with him. Even more blatant was the action taken by Emanual Philibert, Duke of Savoy. In 1572 he organized the order of St. Maurice. The papal promulgation published at its institution declared quite unequivocally that the sole purpose for this knighthood was to combat the heresy of the Reformation. It still exists although it is now combined with the Order of St. Lazarus. The white trefoiled cross is the black Saint's. The particular symbol of St. Maurice's blackness that must have most antagonized the Protestant faction, however, was the one regarding the mystery of Papal authority. Scholars have been able to show, for example, that in the theological debates of this period, even the abstract adjectives, black and white, were defiantly acknowledged by apologists of both stripes to represent the Church and the Reformers respectively. In addition to St. Maurice, there is also another figure connected to the blackamoor coat of arms. It is the semi-mythical Negus (emperor) of Ethiopia, Prester John. To Otto von Freising an Imperial Hohenstauffen Prince Bishop of the 12th century who was tired and torn by the endless struggle between Church and State, this black man who was both priest and king and ruled a land of peace and plenty at the edge of the world became the personification of the ideal state. To this day the arms of the see of Freising is the bust of a crowned blackamoor. Because of their ethnic and geographic origins, it is likely that St. Maurice and his Theban Legion became associated with Prester John as the ideal soldiers for the ideal state. It should be pointed out, furthermore, that, heraldically, since he was the only monarch who could claim the 'Sang Real' or the 'Royal Blood' of Christ because of his descent from Solomon, Prester John was the only individual deemed worthy of the right to bear as arms the image of the Crucifix. Even the earring traditionally worn by the blackamoor is a reference to this sacred privilege. To understand how these two objects are related to each other--the earring and the image of the Crucifix--we must refer back to the Old Testament. In the Book of Leviticus can be found an ordinance describing the ritual ear piercing of any slave who chooses to continue in his master's service after being granted his freedom. Since one of the most important of all Ethiopian royal titles was "Slave of the Cross," the golden ring in the blackamoor's ear was probably meant to be interpreted as a deeply devotional and--considering the belief in the Bible as the Word of God--a highly rhetorical symbol. Due also to the age-old belief that the Ark of the Covenant had been hidden in Ethiopia, the great epics of the Arthurian cycle transformed the Ethiopian emperor into the founder of the Grail dynasty and the ancestor, nine generations later, of the only knight of the Round Table who would achieve the Quest, Sir Galahad. It would appear that the long-standing confusion over whether the Holy Grail was a cup or a stone was a deliberate one. Considering the opportunity afforded by these Ethiopian traditions, medieval writers were able to theologically fuse together the symbols of both the Old and the New Testament: the Tablet of the Law and the Chalice. In the middle of the 14th century, one of the most profound examples of the symbol of the blackamoor can be seen in the use of this image to represent Christ. It is clear from the documentation we have for the city of Lauingen in Germany, for example, that at about this time, the city's seal with the head of Christ wearing a crown of thorns is transformed to the head of a blackamoor wearing a golden crown. That the latter insignia is meant to represent the former is quite obvious from the accompanying inscriptions. One of the earlier ones read: "Sigillum civium de Lougingin" (seal of the city of Lauingen), while a later version clearly explains itself as the "Sigillum secretum civitatis palatinae Lavgingen (secret seal of the palatinate city of Lauingen)." A German heraldic scholar writing before World War II offered two other reasons for a similar coats of arms. He pointed out that Ethiop (sun burnt) the black was a sun sign and therefore a symbol of divinity that could alternately be used for the Son of God or the Son of Man. He also pointed out that from what we know of the cult of the Black Madonna, the blazon of the blackamoor queen was a reference to Mary, the Queen of Heaven or her prefiguration as the Queen of Sheba and that the male versions of these insignia were therefore references to her Son. The discovery of this particular seal was especially surprising to me since I had taken for granted that it was either another reference to Prester John or, even more likely, to Balthazar, the black Wise man of the Epiphany who has, iconographically, almost always been treated as a king. Because his gift of myrrh prophesied not only Our Lord's death but, most importantly, His Resurrection and the proof, therefore, of His divinity, the awe Balthazar's blackness inspired must have had a powerful impression on the science of heraldry. A coat of Arms that is apparently derived from the same theological source as that of the city of Lavingen belongs to the Cruse or Cross family of France. Since cockle shells are so liturgically associated with the sacrament of baptism, their number here probably signifies the three nails of the Crucifixion while the women, in all likely-hood, are representations of Mary and the Queen of Sheba. No more graphic a demonstration of the African figure as a symbol of the sun is to be found than in the arms ascribed to King Balthazar. Initially this had posed a problem for me since the ethnic background of this Wise Man, to my mind, was simply not enough of a reason for this heraldic device. It was not until coming upon an early text describing his coat of arms as that of the sun that I at last realized what the blackamoor on Balthazar's livery signified. Since King Melchior bore a field of stars and King Kaspar, the moon, it is fairly obvious that as an allusion, no doubt, to the celestial phenomenon which had guided them to Bethlehem, the original arms of the Magi had been the sun, the moon and the stars. I do not think it would be unreasonable to suppose that for whatever theological line of reasoning, the heraldic insignia of both Balthazar and the city of Lauingen had been changed at the same point in history. Perhaps even more remarkable, especially from our perspective today, is evidence which would suggest that in the language of heraldry, the blackamoor could be an allusion to God Himself. The most obvious of these examples are to be found in the arms of the city of Coburg, the Kob family of Nuremberg and the Pucci of Florence. Since these three names are derived from that of Jacob (Coburg=Jacoburg, Kob=Jakob, Pucci=Jacopucci), the clue is to be found in the Book of Genesis. In the passage relating the changing of his name to that of Israel, Jacob discovers that the dark spirit he has wrestled with all night long is none other than God in the impenetrable image of His infinite Self. The fact that the name, James, is nothing other than a variant of Jacob, might well provide us with the significance for the arms of Sardinia I described earlier since it is to the Aragonese king, James 1, that their use can first be traced. One of the most dramatic and, certainly, most graphic uses of blackness as wisdom can be seen in the portrayal of the Good Thief from a number of 15th century Flemish masterpieces depicting the Crucifixion. For the ability to recognize his Saviour's spiritual supremacy beneath the harsh reality of the Cross, St. Dismas is not only painted as an African, he is painted blindfolded as well. The blindfold on certain blackamoor coat of arms, therefore, is not a mistakenly placed headband or torse, the standard headpiece of this specific symbol when a crown is not called for. This blazon is, instead, an exhortation or, more precisely, a divine demand that we not only respond to the weakest and most helpless of our neighbours as we would Our Lord but, like St. Dismas, that we do so even while in the death throes of our own personal crucifixions. Interestingly enough, a number of early theologians writing on this subject, have attributed to the Black Wise Man's colour the same kind of reasoning from which St. Dismas would derive his doubly dark imagery; his ability to recognize the Messiah in a lowly manger. The social gospel so strikingly symbolized by this example of the blackamoor blazon is also, interestingly enough, quite implicit in even its most negative use-- that of the vanquished infidel. From what is known regarding the popularity of the Charlemagnian epics during the latter middle ages, we can assume that this image was, in all probability, associated with Marsile, the black heathen king who, as the enemy of all Christendom, was Charlemagne's paramount opponent. Offered baptism at his defeat, Marsile had instead chosen death rather than accept a faith whose adherents he scornfully mocked and condemned for their immoral and reprehensible treatment of the poor. An image that was so scathing a reminder of a community's responsibility to its less fortunate could, therefore, have only been perceived as a positive one. The relationship of the black image to the concept of justice was nowhere more politically utilized than with the Holy Roman emperors of the Hohenstauffern dynasty. Indeed, it would appear that the sable blazon of the imperial eagle and that of the moor's head were meant to be perceived as synonymous. The simple headbands worn by both are, as a matter of fact, identical and, interestingly enough, nothing less, despite the simplicity of the design, than the imperial diadem' of ancient Rome. Also interesting is the fantastic coat of arms attributed to Ethiopia by the heralds of the middle ages. For like the bicephalic bird of the Holy Roman Empire, Ethiopia bore a 'v' shaped emblem with a blackamoor's head 'torsed' at the end of each arm. This parallelism between both sets of heads can, of course, be explained by the "rex / sacerdos" argument which occupied the very centre of the political stage during this particular period of history. To both the papacy that preached the imperial nature of its sanctified position and the Hohenstauffern dynasty that proclaimed the priestliness of its own power, the figure of Prester John became an almost magical icon. Because we today know that the double-headed eagle represented the claims of both the church and the state, it would be quite logical to surmise that the reason why Ethiopia's arms were conceived as double-headed is due to the belief already mentioned that the Negus (emperor) exercised the prerogatives of both priest and king. Because they are described in the 'Tristam und Isult' cycles, the arms of Sir Pallamedes, the Moorish prince who becomes a knight of the Round Table, have received a certain amount of scholarly attention. Chequered in black and white, this highly contrasting design would appear to be nothing more than perhaps the most abstract icon of those dualities already pointed to, such as God and Jacob (Jacquelado is the word for checkered in Spanish), or Church and State. 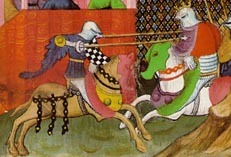 Instead of his coat armour, it is the body of Sir Fierfitz Angevin, the black knight from Eschenbach's 'Parzival' that is patterned in a piebald motif. The fact that the poet likens Fierfitz's skin to a parchment with writing is what expands this symbol to its most encompassing parameters. To the Greeks, Pallamedes, the mythological figure from whom Sir Tristam's Moorish companion derives his name, was commemorated as the inventor of writing, counting, weighing and measuring and the games of the chessboard. Since his name translates as 'Ancient Wisdom', it is fairly obvious that all dualistic tensions were intended to be nuanced; from the most simple 'yes or no', 'O or I' to the most sophisticated of Parmenedes' models regarding 'The I and the Thou' or 'The One and the Many'. Obviously intending to follow the bifurcated symbolism of the Hohenstauffern eagle or the two headed branch of Ethiopia, the writer of the prose Tristam recounts that of all the knights of the Round Table, Sir Pallamedes was the only one who wore two swords. Whether as a reference to Pallamedes' name or the political wisdom Prester John stood for, or, perhaps, as a conflation of both, it is interesting that the blackamoor's head was one of the earliest watermarks in the history of paper making. Examples collected date from about 1380 to 1460. Besides its obvious reference to Prester John, another reason for the black blazon of the imperial eagle is to be found in the rules and regulations governing the use of 'metals' and 'tinctures' in coat armour. Following the classical Greek analysis of light and colour, black and white were considered the two primaries since the interplay between light and dark is what was held to produce the spectrum. Furthermore, white, or more accurately, light, was not defined as a colour or 'tincture' but as the gold or the silver which, to this day, are still the only options for the term 'metal' in the language of heraldry. Black, therefore, was considered the most important of colours, ranking above the red, blue and green standardly referred to as 'tinctures'. Nineteenth century texts explaining the imperial insignia go even further. Because of medieval conceptions of the absorption of light by darkness, the writers theorized that within the color black was contained all the light or the white it had displaced. This is obviously the reason why when the ruby is substituted for red or 'gules' and the emerald for green or 'vert' according to the traditions of gemnological blazonry, it is nothing other than the diamond that stands for 'sable'. In all probability, it is also this line of reasoning that was at the source of the cult of the Black Madonna. For, having borne the Light of Creation within her very womb, the devotion to the Mother of God as the black Queen of Heaven is a superb example of how this law of physics was at one time interpreted. According to the early heralds, the black eagle on a field of gold translated quite literally to, "As God is in Heaven so is the Emperor on Earth". The colour of its outspread wings was explicitly said to symbolize the embodiment or the materialization of light. Furthermore, since it was also held that the dark, by its interaction with the light is what produced the spectrum, the colour black apparently came to represent the intermediary position a divine rights monarch maintained between his God and his people. If the eagle, therefore, was the zoomorphic symbol of these ideas, the blackamoor in Hohenstauffern Europe could only have been interpreted as their anthropomorphic equivalent. Indeed, there are other explanations for the imperial eagle's blackness that bear this out. Believed, as being the most powerful of birds, to fly closest to the sun, like the Ethiop, it was regarded as a solar symbol. Perhaps because it is so recent and therefore so comparatively easier to interpret, one of the more exciting examples of the blackamoor as a symbol of the Redeemer is the one to be found in an insignia designed by Pope Pius VII in the early part of the last century. Commonly referred to as the Moretto, it was awarded to the Princes of the Academy of St. Luke, a class of nobles created exclusively for artists by the Holy See in recognition of their life's work and contributions to the field. It is in the age old tradition that St. Luke once painted a portrait of the Infant Jesus where the key to the symbolism of this Papal decoration can be found. The fact that St. Luke is also an evangelist, is evidence enough that at least, allegorically, he had succeeded in the challenge which, as a true artist, he would, of course, have had to confront--that of conveying in his painting the divine reality incarnate in the form of a human child. As clearly then as the Moretto or, in English, the Little Moor is a metaphor for the incarnate God St. Luke portrayed, so too is the implied challenge to the artist: to portray for the world the Divinity nascent in it. It is this last example in particular which leads me to think that the blackamoor figured candelabra dating back a century or two earlier was meant to be seen in this light. Instead of another embarrassing icon like the lawn jockey or the Aunt Jemima cookie jar--those examples of main stream Americana which many of us find so embarrassing--this classic European 'object d'art' was probably intended either as an injunction or a blessing. And, from what I have already pointed out regarding the imagery of St. Maurice, perhaps the most negative significance they might have had is that they were also intended as Counter-Reformation propaganda. What I hope I have, at least, succeeded in providing here is the outline for a study which, even though based on so arcane and romantically European a tradition as heraldry, could nevertheless prove a great deal more revolutionary than any of the more 'politically correct' approaches to black history undertaken thus far. For if this was the visual language that once articulated or signified the most important of the spiritual, cultural and political aspirations of the West, it would not be too difficult to imagine the kind of impact such a primer or catechism of positive black symbolism could have today on those whose self imagery has been so consistently and so systematically destroyed by the racism of our more recent past. Today, one of the few vestiges that remain of this medieval mysticism can be found in the colour of the robes we wear at graduation--that right of passage by which society declares us to be 'educated'--and the robes of those who make decisions regarding our legal affairs. Although clerical garb might be interpreted as the rejection of worldly comforts and benefits, it is, therefore, a mark of the wearer's more profound pursuit as well. And, as every woman knows, it is the secret of the little black basic which can add immeasurably to her air of sophistication.